Protesters in Syria have cheered on the revolutionaries in Libya, and the fall of Tripoli to a popular uprising last Saturday and Sunday gave new heart to the Syrian reform movement. So far the Syrian demonstrators have been hampered by relative lack of support in the capital of Damascus itself. Damascus is controlled by the ruling Baath Party of Bashar al-Asad. But early Saturday morning there were calls for demonstrators to converge on the Abbasid Square in Damascus, after an incident sure to inflame religious and sectarian passions. Syrian troops allegedly surrounded and stormed the al-Rifa’i Mosque in the capital, killing [or wounding] its prayer leader, Usama al-Rifa’i. 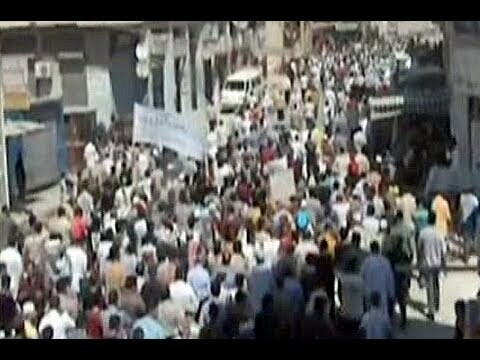 There were also significant demonstrations in the Damascus district of Douma and the main square of the suburb of Kafr Soussa. Regime troops attempted to disperse them. Altogether 8 were killed on Friday. Likewise, Syrian troops surrounded a mosque in the southern, rebellious town of Deraa with tanks and prevented the 2000 worshippers there from coming out after prayers for protests. Since Syria’s regime is secular and the upper echelons of the government and the military are disproportionately drawn from the Allawite Shiite minority, the storming of the al-Rifa’i mosque and killing of its imam is likely to deeply anger Sunnis across the board. If they respond to the call to gather in the historical squares of Damascus, it could be a tipping point in the Syrian movement. Ironically, the Abbasid Square is named for a dynasty that came to power in 750 AD/ CE as a result… of a popular revolution against the ruling Umayyad dynasty.